I have just upgraded to a Kate and now am regretfully selling our much loved Lelit Combi. I bought this from the good folk at Neli Coffee (via Jetblack) around 2010. Edward at Neli has regularly serviced this machine and upgraded it to the ball joint steam wand and installed a Teflon valve to stop the wand leaks (a common issue with these machines). We have usually made only 1 shot a day, it brews a sensational coffee, is in great condition, and will provide years of faithful service. It includes good quality tamper (not pictured) as well as a bottomless portafilter (worth $100). 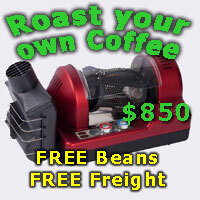 This is a great starter machine and would make the perfect x-mas gift. I would prefer to sell locally so I can walk the future owner through the boiler refill process (a simple but necessary process). Last edited by Lewdannie; 17th December 2018 at 01:07 PM. It does look like a good xmas present for me. Hey Lewdannie Im keen to hear your feedback about the Lelit Kate and why you didnt hold out for the Elizabeth which just landed..keen to get your thoughts - thanks!